Today’s post is the first in a case study series that will showcase the many creative solutions you can take when you’ve landed clients with complex planning issues. Here, we’ll explore an education-based approach to estate planning. After meeting with the Thompsons, you learn that they’ve had an attorney draw up basic estate planning documents (e.g., revocable trusts with A/B trust provisions and pour-over wills), but they’re not sure if the current design is still effective. After all, those documents were drafted when their children were all young and single. Now, they would like to protect inheritances from their children’s spouses, plus understand how they can help with Ally’s medical costs and ongoing support. Last but certainly not least, the couple is concerned about federal and state estate tax exposure, which has become increasingly important as the value of their estate has grown. Let’s take a closer look at how an education-based approach to estate planning can help meet the Thompsons’ goals. Set projections. Often, clients don't know that they have an estate tax problem. Even if they do know, they likely aren’t aware of the actual monetary liability. With this in mind, a good place to start the estate taxes discussion is by setting the stage with a few projections. Current liability can be projected with some certainty, but many assumptions need to be made about the clients’ future liability. Based on the approximate value of the estate ($15 million), the Thompsons have a current estate tax liability of $2,728,080 ($861,280 federal and $1,866,800 state). Although the Thompsons have a combined federal exemption amount of $10.98 million, which shelters much of their estate from federal estate tax, Massachusetts has a very low exemption amount of $1 million, exposing most of the estate to the death tax. Project the liability into the future. This step can be difficult, as you don’t know when the clients will die, how quickly their estate will grow, or what will happen with future tax legislation. So, to run the future projection, be sure to make assumptions for these variables. Between 10 and 15 years is a good default projection, as the numbers are too unpredictable beyond that time frame. You’ll also need to project a percentage growth rate: If a client’s assets are invested in an aggressive equity portfolio, for instance, the assumed growth rate would be much different than that of someone whose assets are sitting in Treasuries and CDs. Last but not least, take care to account for any spend-down of assets for retirement income needs. If spending outpaces growth, the estate’s value will not increase. For the Thompsons, you project the estate out 15 years (to age 80) and select a growth rate of 4 percent over that time period, based on the assets that compose the estate. This gives you an approximate future value of $27 million. The software you use to calculate the liability also inflates the estate tax exemption for each spouse by an assumed 2 percent. Future liability on the estate is calculated at just over $7 million ($3.3 million federal and $3.7 million state). These bookend calculations give the clients a range to consider. You can say with some confidence that their estate tax liability is likely to lie somewhere between $2.7 million and $7 million. This doesn’t mean you need to eliminate their entire future liability. But you can now have a productive conversation about where the Thompsons want to land within the range and have an ongoing discussion as the estate grows. Once you’ve identified the risk and made your projections, it’s time to present your education-based solutions. First, review Janice and Ed’s existing estate documents and determine whether they address the issue of estate taxes effectively. The Thompsons’ documents were drafted many years ago, prior to significant changes in estate tax law. The A/B trust design still makes sense, but they may want to consider incorporating more flexibility in the drafting. Adding disclaimer provisions is a common practice arising out of years of uncertainty in estate tax law. At the first spouse’s death, a trust drafted with disclaimer provisions allows the surviving spouse to decide where the assets will go. Ed dies first, and his revocable trust distributes all its assets to an A trust/marital trust using the unlimited marital deduction. If Janice disclaims any of the assets going to this trust, however, the assets pass to the B trust, also known as the credit shelter trust or bypass trust. The benefit of a disclaimer provision is that, if the estate has shrunk at the time of the first spouse’s death and there is no longer an estate tax issue, the surviving spouse can accept all the assets into the A trust, using the unlimited marital deduction. She maintains full control over assets in this trust, but they are included in her estate at death and receive a step-up in basis. If, on the other hand, the estate is exposed to estate taxes, she may choose to disclaim assets to the B trust. By using Ed’s exemption amount, you could remove the assets and all subsequent appreciation from her estate. Even if the estate does not have a federal liability, she may choose to disclaim up to the $1 million Massachusetts exemption. Unlike the federal exemption, the Massachusetts exemption is not portable between spouses, so she must use it or lose it at Ed’s death. Using disclaimer provisions and a “wait and see” approach is also a hedge against changes in estate tax law. Regardless of the product chosen, the policy needs to be held outside of the estate. If the Thompsons possess incidents of ownership at their death, the death benefit will inflate the value of the estate and increase the estate tax liability. As their advisor, take this opportunity to educate the Thompsons on using a life insurance trust to both remove the life policy from their estate and maintain the policy so that it can do its job when needed. 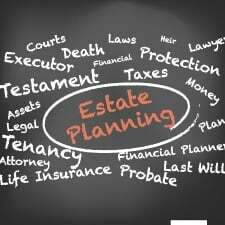 As you know, estate planning is an important issue for many of your clients. If you’re like many advisors, though, you may worry that helping clients with estate planning feels close to the line of giving legal advice. If so, I encourage you to put on your education hat and implement some of the strategies discussed here. Although a legal professional will execute much of the estate plan, you can play a major role in educating clients on estate planning issues, presenting ideas and solutions, and ultimately getting them to the table with an attorney to draft the plan. Are you hesitant to help clients with their estate planning needs? Do you use financial planning software to calculate tax liability? Please share your thoughts with us below!